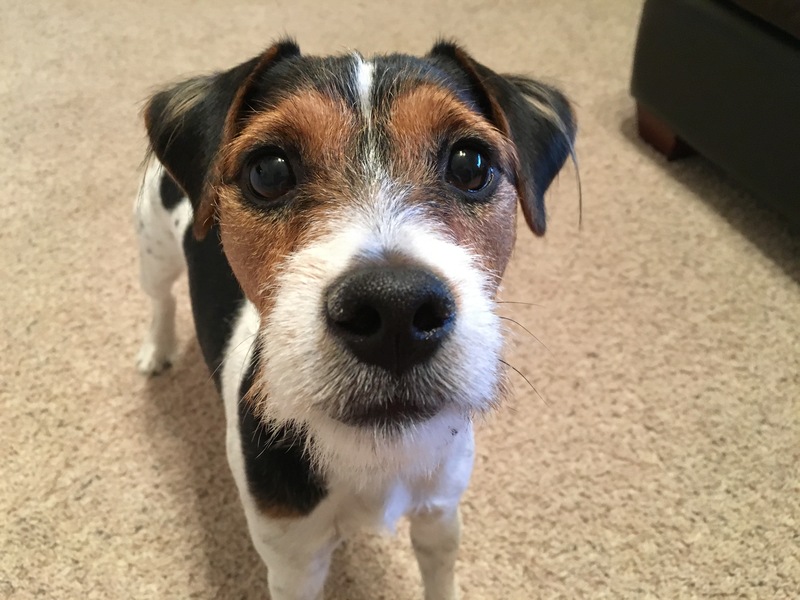 Huxley is a one-year-old Jack Russell Terrier who is fearful of new people, barks a lot, counter surfs, jumps up on people and charges the door. Huxley was a little bit confused when I arrived for the session. He growled in a territorial way as soon as the door opened but once I stepped inside he approached and started investigating me with his nose which is a healthy dog greeting. Shortly after he finished sniffing me, Huxley attempted to claim me by jumping up on me. As soon as he did this, I shifted my legs a bit to communicate that I disagreed with his intent. Huxley immediately let me know that he was not happy with my disagreement. Some dogs will react this way as a bit of a bluff, hoping that their aggressive posture and actions will ward off an intruder. That was not the case for Huxley. When he growled or barked, he stayed in place or advanced forward. This dog was not bluffing. While his guardian made some good progress in moving him away from me, Huxley wasn’t backing down. I had his guardian place him on a leash and hand it to me. For many dogs, being placed on a leash helps them adopt more of a follower or less challenging mindset. Once Huxley was on the leash his behavior did change, although he did not completely calm down. I could tell that he was a high strung dog as he had an instant reaction to any sudden movements or any other activity that caught him by surprise. When a dog is in a heightened sense of alertness like this for extended periods of time, the psychological problems can transfer to physical ailments so its a good thing his guardians reached out for help. I sat down and placed the leash under my foot to keep Huxley near me and block him from engaging his flight mode. I avoided large sudden movements, did not give him any direct eye contact and did not try to pet, talk to or interact with him in any way. My goal was to simply communicate to the dog that even though there was someone that he didn’t know right next to him, that person was not a threat under any circumstances and there no reason to be concerned. Many people mistakenly try to pet or soothe a dog when it is in an excited or unbalanced state of mind. The problem with this is the dog interprets the attention as the human agreeing with the unbalanced behavior itself. In other words by petting your dog when it is in an excited state, you’re actually reinforcing the very thing you were trying to stop. It will be important for the guardians to stop petting Huxley any time that he is in an excited state. It doesn’t matter if he’s excited to see someone, excited in a territorial or even an aggressive way, Huxley simply cannot be petted if he is not calm. Normally this is when I would suggest that the guardian start practicing my petting with a purpose strategy. But because Huxley was raised in a dog show environment, his previous guardian had taught him to stand in such a way that made it difficult to manipulate him into a sitting position. It took at least a half an hour before Huxley finally became comfortable enough to sit down. As soon as he did I pulled out a high-value treat and gave it to the dog while simultaneously repeating the command word of sit as he chewed. I call this passive training and it is something that Huxley’s guardians are going to need to implement to teach him the basics. After explaining how they can reward Huxley for these desired actions and behaviors in a way that helps train him, I suggested a few other things that will help the dog learn to relax. But because Huxley is so reactive to things that he does not understand, I knew that some counterconditioning was in order. Shortly after finishing the above video, a neighbor dropped by expectedly. The guardians initial response was to send the neighbor away so that we could focus on the session, but this gave us an opportunity to put what we just learned into action so we asked her if she could help us out. The neighbor was kind enough to work with us, so we asked her to step back outside and repeat the process of knocking on the door so that I could walk the family’s son through the counterconditioning process. Even though Huxley’s default behavior is to charge the door and bark in a territorial way, we were already seeing an improvement in his behavior. I was planning on simply doing the counterconditioning exercise with the dog far away from the door, but Huxley was doing so well that we were able to push the boundaries and get him right next to this visitor without any reactivity. After the neighbor left I suggested that the guardians repeat this exercise as often as possible when guests arrive. They will probably not be able to bring Huxley so close to the visitor like we did in the above video without me being there. The key is to stop and end the exercise before the dog reacts at all. If it does, you pushed too far. Counter conditioning is a gradual process that needs to be repeated over the course of several days or even weeks while we gradually collapse the distance between the dog and the stimulus until the dog is able to be right next to the stimulus without reacting. I always look for opportunities to introduce positive reinforcement, but because Huxley’s previous guardian had not taught him how to sit or lay down, our options were somewhat limited. I decided to use the recall exercise instead. By the end of the session Huxley’s energy and behavior had relaxed considerably. One of his guardians told me that she had never seen anyone pet him the way that I was without his reacting my growling, barking or nipping. I was able to achieve this because I took my time. I didn’t actually touch Huxley until about an hour and a half to two hours into the session. I only started to pet him after he communicated to me that he was comfortable with my presence. Most people don’t have the patience required to rehabilitate a dog with these sort of psychological issues. Fortunately for Huxley his family is dedicated to the cause. Because his guardians are going to be taking a trip out of town in a couple of weeks, we made arrangements for Huxley to come and stay with me so that I can work with him directly over the course of a few days. Its going to take time and patience, but because Huxley is still at such a young age his family should be able to help him learn to stop being so territorial and reactive around people and dogs he does not know. Based on his skittish and reactive he was, Im guessing Huxley will be one of the few dogs I need more than one session with. If that is the case, you should be able to read a write up of future sessions on the website in the future.